When Amber Gabriel was five years old, she found that she loved nothing more than painting on the walls of her childhood home. She’s hardly the only child to have discovered the joys of this form of youthful artistic endeavor. It’s just that while all the other kids were quickly socialized out of such inappropriate behavior, Gabriel has made a career out of it. In Temple, Texas, a town located in the central part of that state, Gabriel is a professional muralist and portrait painter, although in her heart of hearts, she prefers doing murals. Gabriel does murals – everything from bedroom and bathroom walls to a wall downtown in Temple, 110 feet long and 21 feet high. 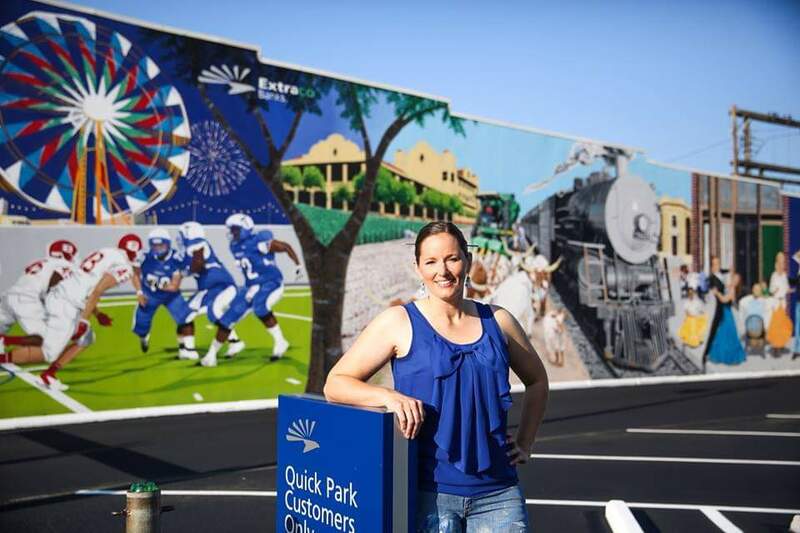 She also paints murals for commercial establishments, as well as family homes, counting local restaurants among her clientele. Gabriel teaches 4th grade math and science, so she had to do that big outdoor mural, visible on her website, PaintbyAmber.com, over nine weeks in a hot Texas summer. Part of her clientele includes parents who bring her in to paint murals on their children’s’ bedroom walls, a task Gabriel embraces. While most of Gabriel’s work takes place in and around central Texas, she is willing to fly pretty much anywhere to do a mural. “It’s so satisfying,” she says. “You’re working with a really big canvas, as it were, and you’re creating something that people will live with and cherish, whether they are children or adults. “Don’t get me wrong – I love doing portraits. It’s always a wonderful challenge to create something beautiful that meets the expectations and desires of the client. But at the same time, murals are my first love. There’s just something about working on a project that big that’s extremely enjoyable for me as an artist.